This is the Memorial Day weekend here in the United States — and on the actual holiday itself The Legal Genealogist will speak of one particular loss in the family. But today… on the day reserved for writing about my family generally… a reminder that Memorial Day weekend is also the traditional start to the summer season as well. And the time when my mother began getting ready to pack us all up and head south for the summer. To my grandparents’ farm (“the Farm”3) in Central Virginia. Where I was promptly … sigh … the odd cousin out. You see, for the entirety of the school year I was the cherished4 younger-by-two-years-and-six-days sister. The constant companion, roommate and playmate of my sister Diana. One half of a go-everywhere-do-everything-together team. But the minute we hit the ground running at the Farm, I was chopped liver. My cousin Kay, two years older than Diana, had decreed (probably about the time I was born) that Diana was the absolute youngest cousin who could ever, under any circumstances, be counted among the Older Cousins. No joining in with what they were doing, oh no. I was, by cousinly fiat, Too Young for the older cousins. Now you might think that in a family as large as mine — I have roughly a kazillion first cousins5 — there’d be plenty of other cousins to pal around with. Except that I am three full years older than the next oldest set of cousins, four full years older than the next, and so on. If I did what they were doing, I was utterly bored out of my skull. And if I led them on the kinds of adventures I wanted to be doing, I’d be (and often was) in trouble with the grown-ups. I was, by parental fiat, Too Old for the younger cousins. Which is why, so much of the time, I really hated spending time at the Farm. Until my grandmother, Opal (Robertson) Cottrell (1898-1995), realized what was going on and stepped in and saved my life. And there she pointed out to me the shelves just below the ceiling that ran all the way around the room. Shelves that were filled with books. Reader’s Digest Condensed Books, to be exact. 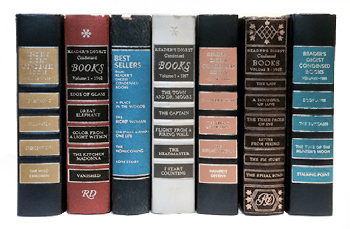 The Reader’s Digest Condensed Books were a series of hardcover anthology collections, published by the American general interest monthly family magazine Reader’s Digest and distributed by direct mail. Most volumes contained five (although a considerable minority consisted of three, four, or six) current best-selling novels and nonfiction books which were abridged (or “condensed”) specifically for Reader’s Digest. There were dozens of these volumes by the time my grandmother introduced me to them — and more every year that we summered at the Farm. And I had carte blanche to read them. I remember taking the first one and climbing a tree down by the garden gate so that the younger cousins couldn’t follow me. There was a fork up well above where the younger cousins could reach that made a perfect library perch. Over that summer and the summers to come, I read every single one of those condensed books. I read Cry, the Beloved Country by Alan Paton. Home Town by Cleveland Amory. The Cardinal by Henry Morton Robinson. I devoured The Caine Mutiny by Herman Wouk. Return to Paradise by James A. Michener. My Cousin Rachel by Daphne du Maurier. I learned about Life Among the Savages from Shirley Jackson and The Desperate Hours from Joseph Hayes and The China I Knew (My Several Worlds) from Pearl S. Buck. I cried over Old Yeller by Fred Gipson and Good-bye, My Lady by James Street and Goodbye, Mr. Chips by James Hilton. And I began a lifelong love affair with science fiction with A Fall of Moondust by Arthur C. Clarke and with politics with Advise and Consent by Allen Drury and with the law and social justice with To Kill a Mockingbird by Harper Lee and with history with The Day Lincoln Was Shot by Jim Bishop. Now, as a teenager and young adult and over the years throughout my life, I have re-read many of these in their full unabridged versions. But so many of them I wouldn’t even have known about except for being the odd cousin out. And even for being the odd cousin out. Image: “Reader’s Digest Condensed Books and Best Sellers,” user Terriloiu, via Wikimedia Commons, CC BY-SA 4.0. When I saw the image on your blog I gasped with pleasure. I loved having these books available to me during the summer months. How nice to experience the pleasure of that memory. Glad to hear from another RDCB fan! We lived on Guam in the 50’s and my grandparents lived in Hawaii. We’d fly to Hawaii for our fix of “civilization” at that time. I remember looking forward to visiting my grandparents for the same reason! The basement bathroom had those books! I’d head to the bathroom, get a book, and hide in the basement reading it. They also had issues of Readers Digest which I read cover to cover. My mother want us to take dance lessons and piano lessons. My sister did. I didn’t. I read Readers Digest publications! Hmmm… that doesn’t ring any bells with me — not finding it in a plot search on Google either. Rats! Sounds like a good one! I remember that story. Have that RDCB on a shelf somewhere. Just moved so still refilling newly positioned bookshelves but will look for it. I too have a great love of books, hard copy only as I can’t seem to get into the electronic thing. Started my voracious love as a child in and out of hospital with a heart condition. Couldn’t do what my siblings and friend did so my parents would seat me in a chair outside to watch and hand me a book. My parents had many bookshelves full and encouraged us to read. My maternal grandmother had a subscription to RDCB and would bring over the latest arrival to keep my going. Years later and I had my own subscription. My book collection probably totals more that 6000 now not including my children’s book collections. There are four floor to ceiling shelving units in the LR and dining room has 10 more IKEA brand around the walls as well as each of my children’s BRs have more full shelves. We are always looking for ‘gems’ at the local used bookstore. I remember my son, probably around 18-20 months old in his car seat with a huge picture book quietly flipping the pages as I drove. This was the only way that my son who is severe ADHD would sit in his car seat and not scream to be let out. In his mid-30’s today, he still will grab a book to relax especially if his ADHD has been giving him a rough day. My daughter who is disabled is also a voracious reader with a jury-rigged holder that lets her read anywhere. With the complaints in education circles today that our children are too electronic oriented, I am pleased that my children will take a book over an electronic game hands down. My neighbors children visit frequently to peruse our shelves and say they find a more relaxing and quieter time at my home choosing a book than going with friends to the local library. They also do not have a fixed timeline to finish the book so they can be re-read over and over if they likes. I am looking for the title of a book I read as a child. Storyline was about a young royal girl from about 1000AD who somehow came forward in time to meet youngters in this day. Remember a scene where she learned about hot water coming from a bathtub tap. I would like to get that one for my neighbor’s children but online searches haven’t helped. Anyway, thanks for the memories of my love of books and how that has been passed down to my children. I love your family stories and this one really hit home. I remember looking forward to a new RD Condensed book coming in the mail. Reading was such a guilty pleasure during the summer. I remember getting stacks of books from the library and Mom would let my brother and me lay in bed and read in the mornings. When we heard Dad’s old truck coming over the hill we would all jump up and dash around like we had been working madly all morning. I have been looking back on my life and trying to write about different things that were important to me and this will make such a good subject. Thanks for the reminder. Judy, thank you! The titles you mention brought back a lot of happy memories. One of my mother’s favourite stories was of the night she dreamed that the flood waters were rising, the Hills Hoist had floated away, and I (aged 9) was standing in my bedroom, one leg in my trousers and a book in my other hand. Like you, I remember one summer when I spent my waking moments reading the entire collection of Dickens’ books from a boxed set my much older cousin had left at our house. Good plan, Granny! Yeah, when you’re 40, an age gap of three or four years is insignificant. But when you’re 8 or 9 years old, you’re really in a different bracket in terms of what you can do and where you can go without supervision, that’s for sure. So many memories…now you will find them in every estate sale for less than $1. Under similar circumstances, I found a shelf of Ian Flemings Bond books. That was illuminating at age 10! Oh, my, same here! I read James Bond books one summer and learned a lot. I also was an avid reader. I liked to go under my bed headboard with a flashlight and read. My grandmother exposed me to the RDCB. Would read every visit. Lucky you with so many cousins! I have one First Cousin and I have always been the Odd One. My sister was 5 yrs younger – just the wrong age bracket & all other cousins were 10 years or more younger and did not live close by. Have tried to close the gap as we are much older but it is difficult with few mutual memories. That’s a wonderful tale! My mother’s mother knew that with three brothers I was the odd one out. She taught me to sew & told me family stories. Quilting & genealogy are still a big part of my life. My Nana has a special place in my heart. I’m struck by a few things – 40 first cousins! I had two but one died in the 70’s so now just one. I always longed for a large family and now I’m finding second, third, etc. cousins to welcome into our family. Grandmother memories are the best. My grandmother always had coloring books and crayons for us – I will never forget lying on the floor coloring with my sister. I hope that years from now my grandkids will have sweet memories of their time with us. I just had a tough time, as I am certain that many cousins did, when the week after they’d closed on the Farm, those folks buldozed that farmhouse. It stayed on Goodle Maps for awhile, but it isn’t there anymore either. Moving ahead after that, we’d gather at uncle Mike’s for big holidays, and he’d built a place on a small part of the original plot of land that he’d bought from Uncle Bill. But those have ceased now, too, and it’s hard. THank Gdo for our yearlo post-Christmas dinnrs with em Geissler cousins (and occasionally others). Thanks for the post .. and for the one about Daddy Clay’s bit about the Civil War.